Charkula Dance of Madhya Pradesh: This dance is performed in the Braj region of Uttar Pradesh and Madhya Pradesh. Charkula is a dance form that owes its birth to Krishna era. It is therefore not surprising that it is so popular in Braj region of Uttar Pradesh. The dance has many legends attached to it. One legend goes by that the mother of Radha, consort of Krishna, ran outside to deliver the news of her birth carrying Charkula or oil-lamps on her head. Since then this became a tradition to perform this dance on auspicious occasion but primarily on the third day after Holi, the day Radha was born. The other legend says that milkmaids of Mathura re-enacted the seen where Krishna held Govardhan hillock on his finger to save people from the rain. 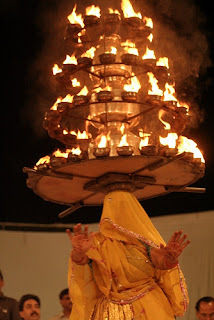 In the process of acting, girls started raising Charkula over their head in order to symbolize the hill. Women are dressed in long skirts that reach up to the toes. There is a colorful blouse and the dancer covers her body and face with the veil. These women carry a large multi-tiered circular wooden pyramid having 108 oil lamps on their heads while dancing. They perform their dances to the tunes of Rasia that is the song of Lord Krishna. The dance has synchronized steps to the beats of the drum. The movements of the dancers are limited due to the heavy load of stuff on their head. They cannot bend their body nor can they move their back. In spite of these limitations the dancers dance gliding, bending, and pirouetting to the tune of the song.